McNary senior Kolby Barker considered canceling his visit to the Air Force Academy and committing to the University of Wyoming. 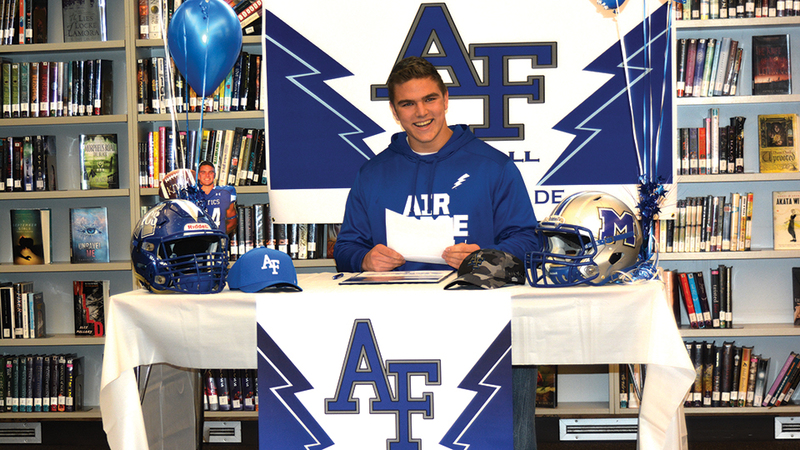 He’s glad he didn’t as Barker signed a national letter of intent to play football with the military academy on Wednesday, Feb. 1 in the McNary library. The visit was different than Barker expected. But what really set Air Force apart is what the academy would do for Barker after football. Barker plans to get a business management degree and then either go to pilot school or become an acquisitions officer. Barker didn’t always plan on playing Division I football either. But after his junior season, programs began flooding him with attention. Wyoming was the first to offer, then Air Force last summer. Barker will have a shot at early playing time as both of the Falcons starting defensive ends were seniors. “I don’t assume that I will beat out a guy who’s already been there for three years but the opportunity is all there,” he said. While Barker was unanimously voted first team all-league by the Greater Valley Conference coaches, what stands out to McNary head coach Jeff Auvinen is what Barker did off the field for the Celtics. Barker’s leadership really shown in a pep talk on a Saturday morning after a tough loss this season. Air Force, which plays in the Mountain West Conference with Wyoming, finished 10-3 last season, including a 27-20 upset of Boise State followed by a 45-21 win over South Alabama in the NOVA Home Loans Arizona Bowl.